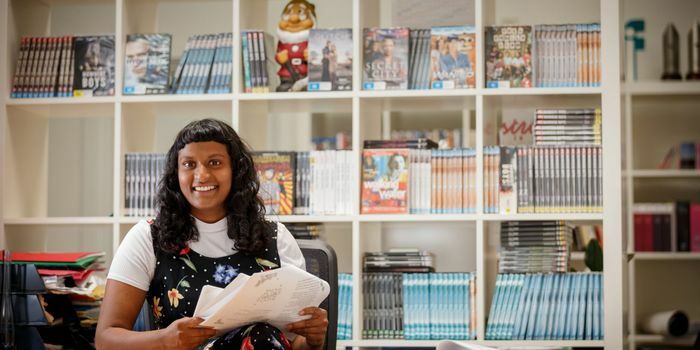 Hannah Samuel graduated in Screenwriting at the Victorian College of the Arts in 2015 and is now Office Coordinator at Matchbox Pictures. She shares her thoughts on what it’s like to love what you do, and offers some tips to budding screenwriters. Hannah Samuel at Matchbox Pictures. By Sav Schulman. Day-to-day of VCA life was pretty great. Nearly every single day of my degree, I’d saunter down from Flinders Street Station listening to Let it Go, as it was the only song that I’d worked out how to put on my iPhone, and head into the campus cafeteria to hang out with fellow screenies before class. Then we’d all saunter in to class, watch some scenes and discuss them, learn about structure, learn about each other, do some writing exercises – anything you could imagine. I’d then head back to Flinders listening to Let it Go, feeling excited by the thought of heading back to uni the next day. Originally I thought I’d study law, but my English teacher at school suggested the VCA to me. I went along to the Open Day and sat in on a session about Screenwriting. Until then I didn’t know such a course existed – it was everything I loved wrapped into one university degree. Who knew a reality existed where you could do what you love and love what you do? The VCA – those three letters became a magic spell for me, my own little Hogwarts that I’d give anything to attend. Studying screenwriting comes with its challenges. It’s a time-consuming degree, the hours are long and you need to spend hours on top of that, outside uni, writing, reading and watching. But can cramming in the last 50 years of cinema into your weekend really be considered homework? I loved my cohort and the teachers. We watched movies and dissected them on a Thursday morning. We had tutorials made up of four people, where we shared our scripts and became so invested in each other’s work that these alternate worlds became part of my university experience. We learned from each other and grew together – and I can’t wait to work with those people in the future. We were instilled with a drive and work ethic that made us believe we could actually make a career out of our passions. My highlight was when I broke the table in the cafeteria in my first week and everyone lost their lunches, all because I thought it would be easier to climb over the table, rather than get up and walk around. But really, the highlight of my degree would be producing my graduate film WOOF! which was written and directed by fellow Bachelor of Fine Arts (Film and Television) student Nina Buxton. The process taught me so much and watching it surrounded by family and friends on the big screen at ACMI was definitely the highlight of my three years. I’d like to continue working at Matchbox Pictures and, in the coming years, work as a script coordinator on one of their shows. Eventually I’d like to work my way up to script editor until eventually I get the dream gig of realising my first script. In the meantime I’m going to continue writing my own stuff. I’d also like to collaborate more with my screenwriting buddies. The VCA taught me to make the most of opportunities, to work hard, and that networking is one of the most important skills to have. It also taught me to be prepared. Things often don’t work out so you have to keep at it and be in it for the long-run. To budding screenwriters, I’d say feedback is everything and you need to learn how to take it and give it. Write as much as you can and listen to the feedback of your peers and teachers. Email writers you like and ask them to meet up for coffee, pick the brains of those around you. Make the most of the support you’re given and create creative partnerships for the future.